Built in 1898 by Gabriel Block Wathne, Kronen Gaard Hotel was originally a summer country residence until 1925 when it was converted to a women's psychiatric rehabilitation facility. After 57 years of operation, Trodne Psychiatric Facility, named after its tranquil and serene setting, was closed to undergo transformation to become a luxury hotel. Owners Kjell and Sygni Steinsvåg's risky undertaking proved to be successful as Kronen Gaard Hotel remains choice accommodations for Norwegian country hospitality. Featuring 35 charming guestrooms and suites, Kronen Gaard Hotel is an intimate retreat nestled amid Norway's finest natural offerings. Passionate about using local ingredients, the kitchen at Kronen Gaard is a comforting traditional experience balanced with inventive flavors. 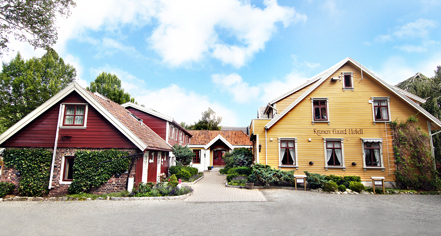 A stay at Kronen Gaard Hotel is an experience rich in history and traditional warmth. The south side of the property features a weeping beech tree planted in 1907, likely the oldest in the region. Age Requirements: Guests are required to be 18 years or older with photo identification to check-in. Occupancy Restrictions: Varies by room type. Hotel has 34 rooms and overall maximum occupancy is 69 people. Parking: Self-parking: Available; complimentary. Valet parking: Not Available. Pet Policy: Service animals allowed: Yes Pets allowed: Yes. Dogs and cats only. Extra charge of NOK 300 per accommodation. Rollaways: Available upon request; NOK 200 per night. Transportation: Accessible by bus from Sandnes Center. Built in 1898 by Gabriel Block Wathne, Kronen Gaard Hotel was originally a summer country residence until 1925 when it was converted to a women's psychiatric rehabilitation facility. 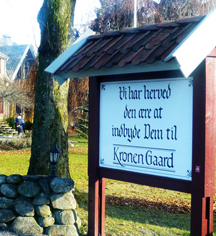 Learn more about the History of Kronen Gaard Hotel .